The evil Dr. Sloth's latest batch of minions weren't terrible enough for his liking, so he tossed them in a toybox they could never escape! 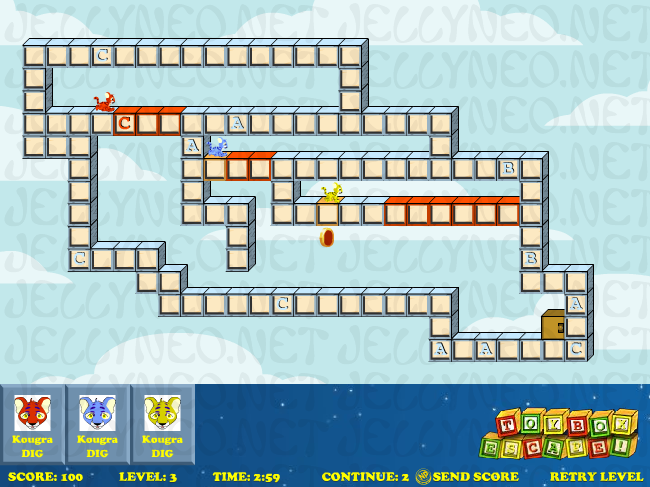 In this game, your job is to control the programming of the robotic Neopets Sloth created to help them escape to safety. Use each Neopet's special skill to help the group escape the depths of Sloth's toybox! A, uh, slight miscalculation.... Hmm, I'll just toss these cruelty-lacking models in my toybox. 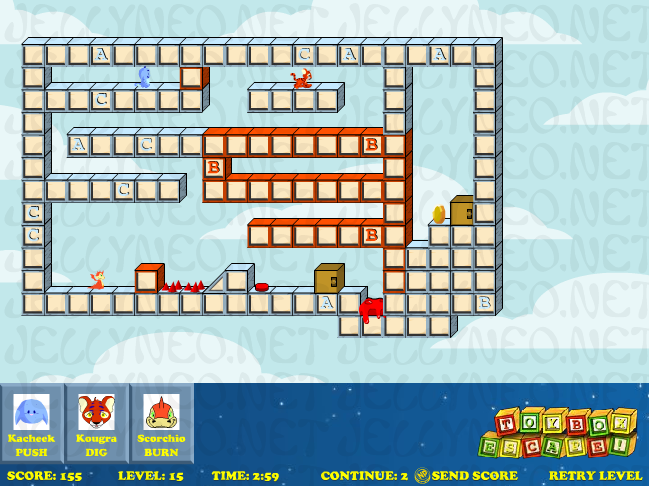 In each level, you are presented with a room of sorts that you must navigate your way out of using the Neopets trapped in that level. Each Neopet has a different special ability. To use a Neopet's special ability, click on its picture at the bottom of the screen. 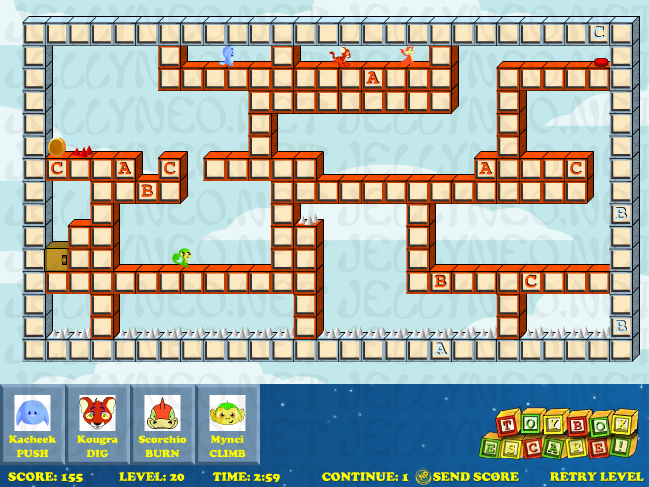 There are also obstacles, such as spikes or lava, that you must navigate around. There is also a bonus coin on each level that gives you points for acquiring it. And, of course, there's the exit door. The ultimate goal of each level is to get each and every Neopet through that door. If any one Neopet fails to accomplish this task, you'll have to start the level over. You only have three continues, so use them wisely. Last but not least, you get a level code every time you finish five levels that you can enter on the start page at any time. This way you can work on perfecting Level 15 without starting over at Level 1 each time. 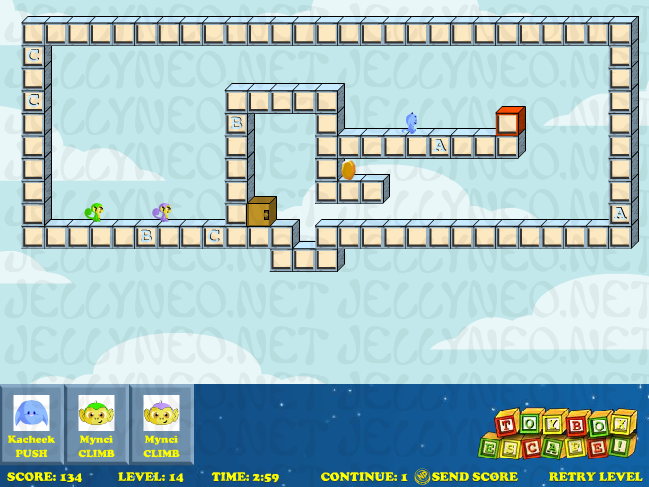 Mynci Climb -- a Mynci can climb a vertical wall to reach high-up bonus coins. 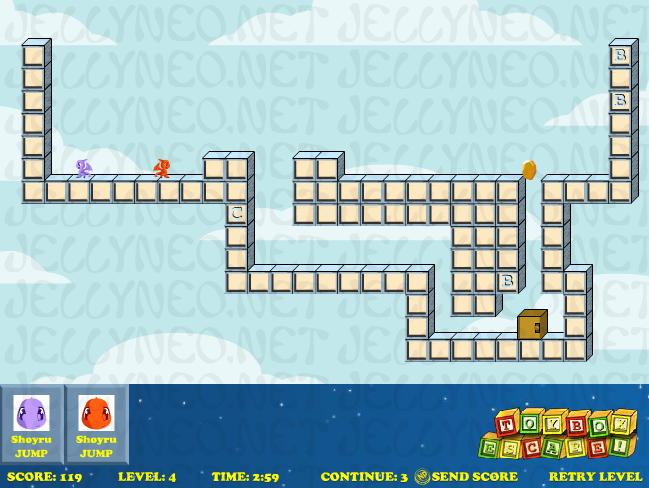 Scorchio Burn -- a Scorchio can breathe fire at certain walls (usually red or orange) to free the Neopets from a blocked off section of the level. Kougra Dig -- a Kougra can dig through certain parts of the floor (also usually red or orange) beneath it to reach lower portions of the level. 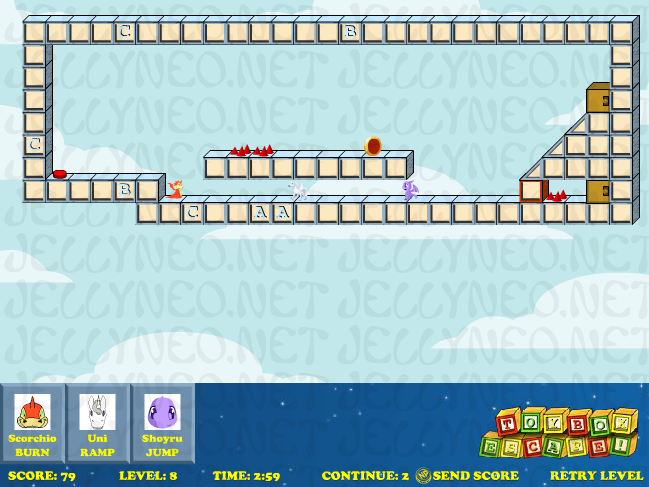 Shoyru Jump -- a Shoyru can safely cross chasms within the level to access areas unreachable by other species. Kacheek Push -- a Kacheek can push certain blocks away to free up space in the level. For each level, there is a certain sequence of moves you must make in order to get the coin and exit in the fastest possible amount of time. 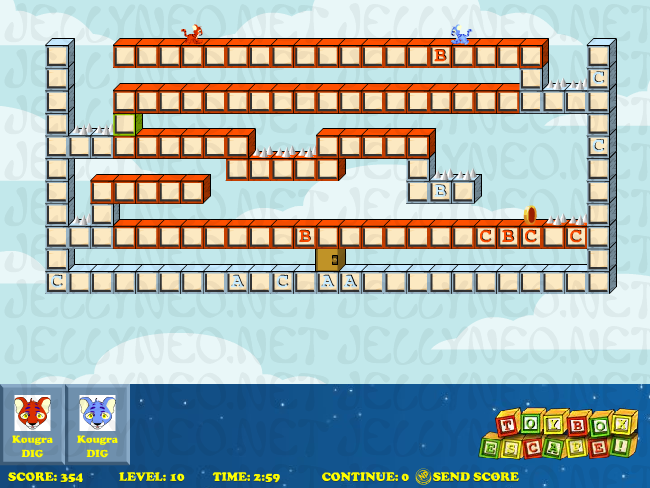 This section includes instructions (plus screenies) for all levels we at JN HQ have managed to figure out the necessary moves for, as well as the best times we have managed for all you high score table seekers. Click the green Mynci, then click the purple Mynci after it turns around so it can get the coin, then click it again after it falls off the coin ledge to get it to the exit. Click the green Scorchio, then click the red Scorchio after it turns around to get the coin, then click it again after it gets the coin to get it to the exit. This takes quick hand-eye coordination: for max points (wait until they all turn once, you probably won't be able to get them the first go-round), click the yellow Kougra as it hits the orange block to get the coin, then jump immediately to red, then immediately to blue. Be ready before you click 'next level': click the red Shoyru (on the right) to jump onto the ledge, then click again just before the edge to jump across the chasm and get the coin. Immediately afterward, click the purple Shoyru to get it onto the ledge and moving toward the exit. Click the Uni and the Kacheek right away, then the Kougra just after it turns around. Click the Scorchio after it turns around, then click the Uni once the Scorchio is at least 4 blocks ahead of the Uni. Click all three right away, in the order purple-green-blue, then wait for each Mynci to turn toward the final climb and click them again in turn. Click all three right away, in the order blue-green-yellow, and you're set. You have to be very accurate, though, because if you click the yellow right away, the block will land on the green, and if you don't click the blue or green fast enough, they could fall into the spikes below. Click first on the Uni and the Scorchio, then wait for the Shoyru to scale the Uni ramp. Don't worry, the Shoyru will get rid of the spikes before the Scorchio reaches them. Then, take aim for the ledge with the coin on it--this is hard, don't worry if you can't get it right away; I recommend holding down your mouse button until it hits the very edge and releasing. Once you have a free second, click the Uni once more, and you're golden. This is a tricky combination - get ready! To begin, click Kacheek right away. Wait until the Uni is walking left and click that as well. Then, click the Scorchio so that he burns the block leading to the exit. Make sure he burns this block after the Kougra has turned around - this allows the Scorchio to head to the exit while the Kougra climbs the ramp. As soon as the Kougra climbs the ramp, release the Uni. Double click the Kougra when it is above the coin. You'll have to be fast on this one. It doesn't much matter which Kougra you use to dig through, just be fast. Stick with the same one, and the other will safely follow its path. Whichever Kougra winds up on the final level before the exit door with the shortest path to travel to the coin is the one you want to watch--when it hits the coin, click it instantly or it will hit the spikes. While you're waiting for it to reach the coin, click the other so it gets to the exit beforehand. 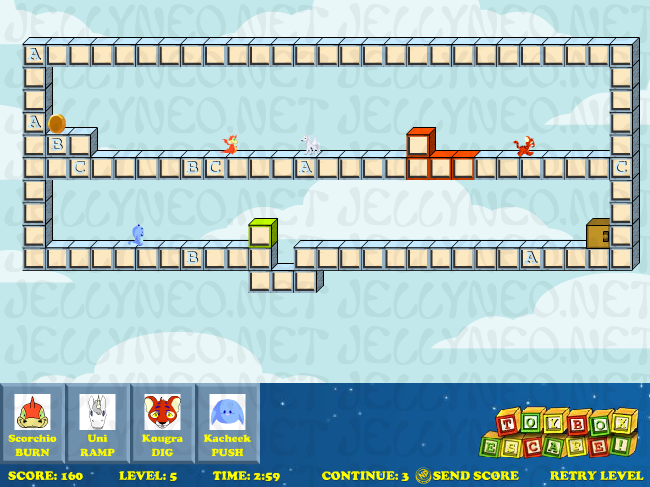 Click the Shoyru to make it jump over the block on the top row. Click it again to jump over each set of spikes (click it one block before the spikes). Then, click the Kougra the next time it hits the red block on the ground--the Shoyru will have reached the button for the spikes by then. Click the Shoyru to have it jump over the red block again. Click the Kougra once more when it and the Scorchio are moving left. Click the Shoyru immediately afterward to make it jump over the newly formed chasm. 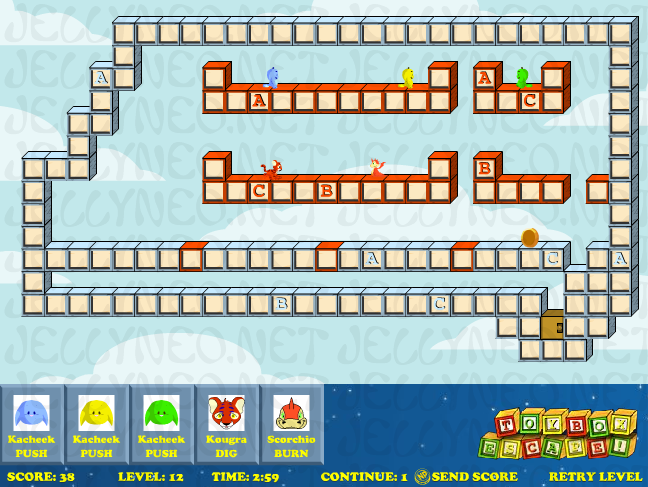 Click it again to jump over the block and then once more over the next chasm. Then, click it one last time to get the coin. 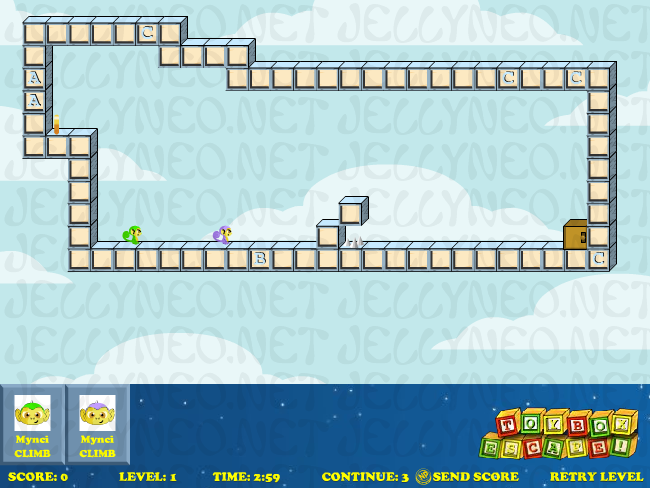 Click the yellow Kacheek once it is going left to push the block off the ledge. Next, click the Kougra to get it and the Scorchio off their ledge. Click the green Kacheek when it is going right to push off that block. Next click the Scorchio. Click the Kougra just after it turns rightward. Click the Kacheek right away to push off the green block. Click the Scorchio while it is turned left to get the coin. Click the Kacheek again (all in rapid succession) to push the green block off the ledge it lands on. Click the Scorchio twice to burn through each red block. Click all three right away. Once the Kacheek has fallen to the right of the block, click it again. Click it once more when the block reaches the space to the right of the right-hand block of the ledge with the coin. Then, click the nearest Mynci to climb the new wall. Finally, click the Kacheek once more. Click the Kacheek instantly, and I mean instantly. Then, click the Kougra three times to get it to the exit. The third time you click it, you must dig through the leftmost block on the ledge so that it will turn off the spikes for the Scorchio. Click the Kacheek once it's on the last red ledge to get the coin. *Make sure it's facing right when you click the Kougra the last time. Then, click the Scorchio to get it to the exit. Do one section of Kougras at a time. For the red Kougra, dig once, then dig through the second block on the next level. 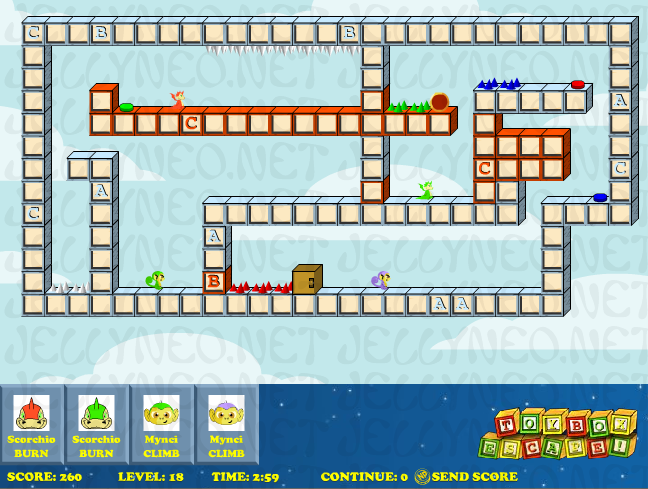 Digging through the first, third, or fourth block, as seen in the level screenie, will get you trapped. Then, dig three more times. For the green Kougra, dig through one of the left two blocks, then dig once after it falls to the right. Then dig on the second-to-last block to the right to get the coin, then once more in the orange region to get to the door. The blue and yellow Kougras are the hardest. Dig on the second from the right with the other Kougra as far away as possible, then dig on the C block and again instantly on the block below it--it's important to be fast on this one: you get one chance before you hit the spikes and there's only one right answer. This level is a refreshing break from complexity. Have the Kougra dig to get inside the open space, then have it dig twice more. 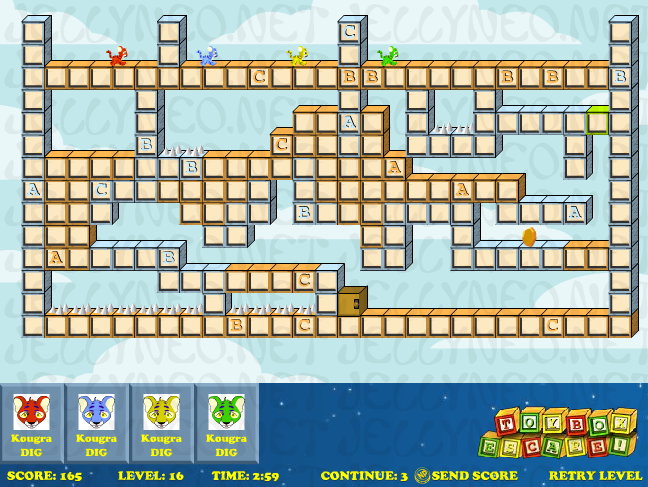 The twice more must be on the rightmost column of blocks so that the correct number of Neopets will cross the button to disarm the spikes. Then, have the Shoyru jump over the block, and you're good to go. It's easy if everyone is facing the right direction, but you may have to restart a couple of times to get it. First, click the purple Mynci, then click the green Scorchio, then the green Mynci. Click the red Scorchio once it has turned off the green spikes so it can get the coin. Click the green Mynci again to turn off the spikes for the Scorchios. Once it has done so, click a Scorchio, and you're done. 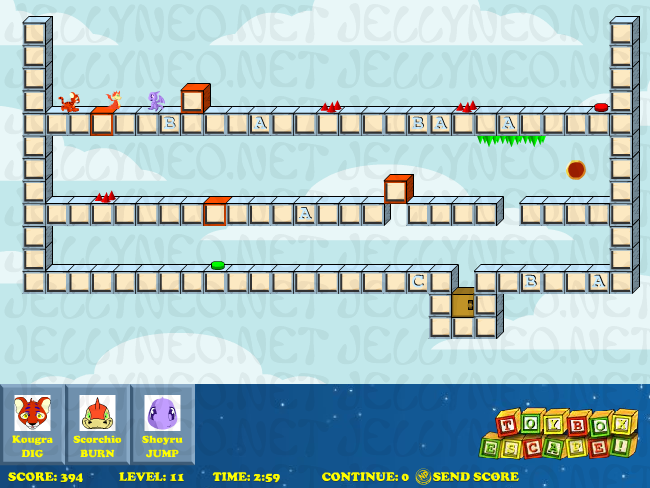 Click the purple Shoyru several times to get it across the first row of blocks safely. 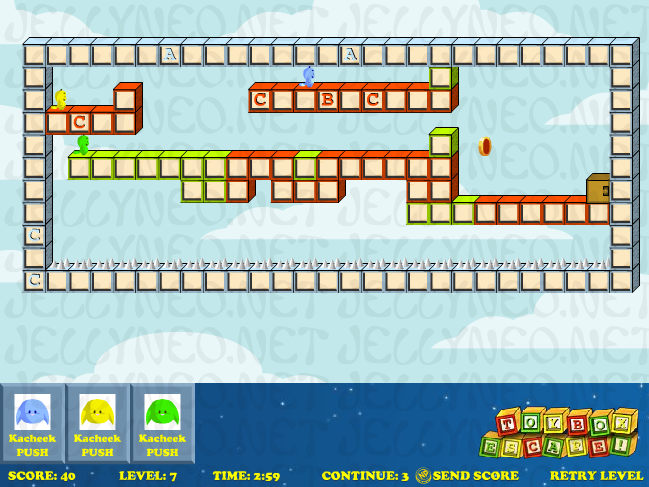 Then, click either Shoyru to get it onto the double blocks and again to get it to the row of coins. Click the other to get it onto the double blocks so it can reach the exit. 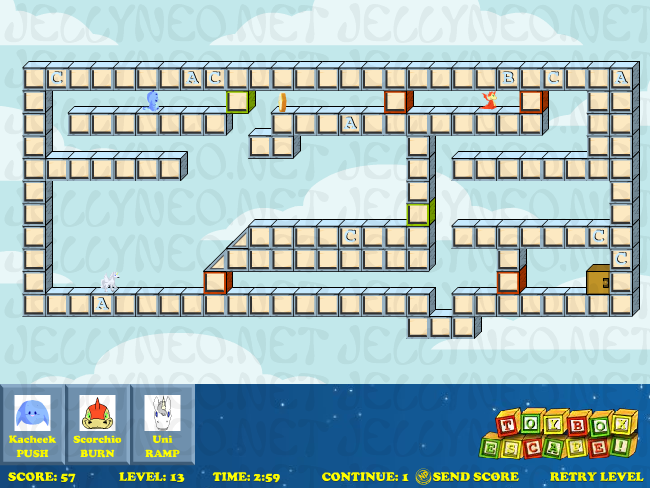 On the coin row, jump to reach the coin, then let the Shoyru fall off the edge and continue toward the exit. Click the Kougra twice to dig it and the Scorchio through their ledge. Then, click the Scorchio once it is facing left to burn passage through for it, the Kougra, and the Mynci. 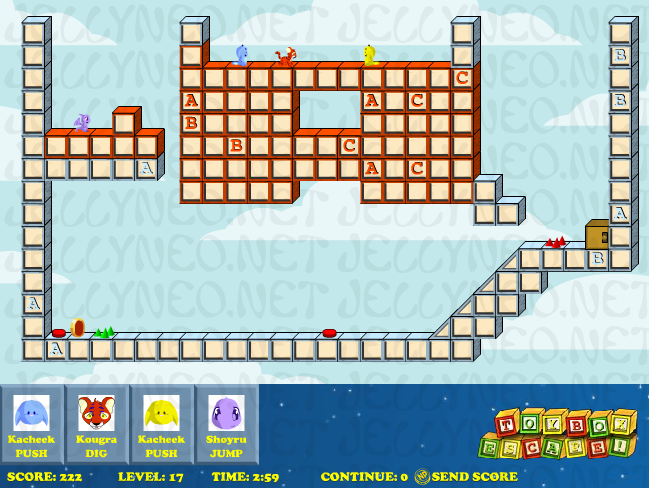 Then, click the Mynci to have it climb to the newly accessible ledge and click it again once it has reached the top. It will turn off the spikes to make the coin reachable. Once it is near the button, click the Kacheek. Lastly, click the Scorchio once more when it is facing leftward, and you have completed the game. Every time you complete five levels, you are given a code to skip to the next level from the start page in the future. If you're going for maximum points, don't start past level one, but if you just can't get the hang of a later level, these codes can be very handy for keeping you sane in your endeavours to practice. 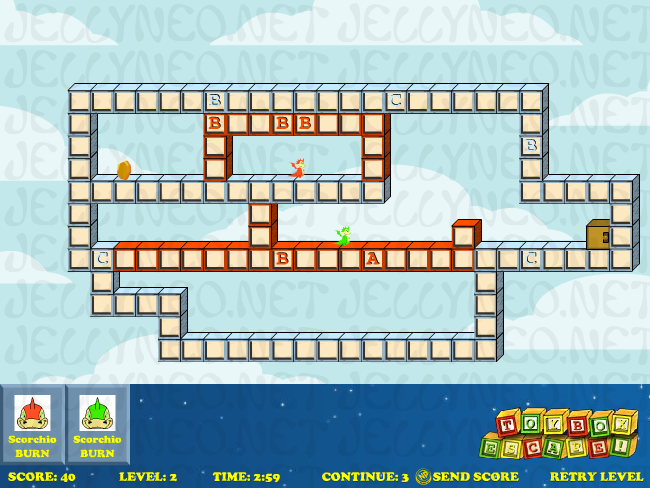 The codes are 8 characters of capital letters and numbers, and you'll be given each one upon successful completion of the previous level (i.e., you'll be given the one for level 6 when you finish level 5 and are moving on to level 6.) Make sure you write them down somewhere so you can use them later. Well, that's about it...hope it helped! Good luck with your escape mission, and get playing!